arroz con pollo—if it were Chinese it would be chicken fried rice. Shredded or chopped chicken fried with rice and a variety of chopped vegetables. boca or boquitas—snack. The one word translation while apt, falls short of a full description. Bocas are a cultural item as much as a food item. casado—literally married. This refers to a set meal that usually includes some combination of rice, black beans, plantain, cabbage, salad, and meat. For example a casado pollo frito might be one large or two small pieces of fried chicken, a small salad of tomatoes and palmitos and a side of rice and beans. chorreados—corn pancakes accompanied by natilla (sour cream) and commonly sold by vendors at fiestas and other events. elote—corn on the cob, best when charcoal roasted (elote asado), but also found boiled (elote cocinado). empañadas—turnovers stuffed with meat, potatoes, cheese, and/or beans. enchiladas—thick pastries stuffed with meat, potatoes, and or cheese. ensalada—salad. Ensalada ruso is like coleslaw but the vegetables may vary from cabbage and carrots. gallo pinto—literally painted/spotted rooster. Black beans and white rice are cooked together with a hint of onion, red pepper, cilantro and broth to create this ubiquitous national dish. Along the Caribbean coast, coconut milk is sometimes added. gallo—meat, bean or cheese tortilla sandwich. olla de carne—literally pot of meat. A rich soup of beef stock with yuca (root), chayote (squash), ayote (pumpkin family), and other more familiar vegetables. palmitos—hearts of palm. An 18-foot (5 meter) pejibaye palm tree (Bactris gasipaes) yields a 4 foot by 1 inch (120cm by 2.5cm) heart, about enough to fill a dozen cans. patacones—plantain, sliced thin and deep fried. A common Caribbean side dish. pejibaye—golf ball sized yellow to red fruits that grow in large clusters on the pejibaye palm tree (Bactris gasipaes). The fruit is boiled and the starchy nutty flesh eaten cold. pupusas—corn pancakes similar to chorreados, but with the El Salvadoran inspired addition of cheese. Salsa Lizano—tamarind is the most easily identified ingredient in this addictive bottled sauce. Its availability in the duty free shops at the international airport is a testament to its unique delicious character. Have you ever seen ketchup displayed between the Gucci and Sony cases? sopa negra—black beans and chicken stock are the base for this rich soup which often contains a hard-boiled egg. 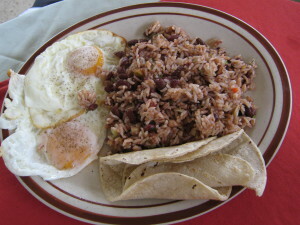 In Guanacaste, you may find it in the spicier Cuban version. tamales—pork, chicken or potatoes with chilies or corn folded into cornmeal and steamed in a banana leaf. A Christmas tradition. tortillas—corn flour dough rolled flat then fried on a dry griddle. cas—Costa Rican acidic guava, small and tart but remarkably refreshing with sugar and ice in a refresco. guaba—the white pulpy flesh that coats the seeds inside and elongated fruit pod of the Inga tree. guanábana—soursop, large dark green fruit with fleshy spines covering white flesh. limón—lemon. There are dozens of varieties of citrus that take the moniker limón. The familiar yellow oblong, green ones that look just like limes but have a distinct flavor, the ones the size of large grapes with bright orange flesh are often squeezed into cerveza and the large warty limón dulce which are best as lemonade. mamones—resemble small limes, crack like eggs, have flesh like grapes and a seed like an almond. mango—two varieties are common. The smaller are masculine—mangos and the larger feminine—mangas. manzana—apple. Apples are a traditional Christmas treat, and most of what you find in Costa Rica have been imported from the United States. naranja—orange. It may be a unique experience for you to pluck an orange from the tree, but be careful the ones in front of your hotel are often ornamental varieties that are better not eaten. papaya—there are two main varieties of papaya in Costa Rica: the smaller, round, yellow amarilla, and the oblong, red-orange cacho. tamarindo—tamarind, the sour fruit of the tamarind tree makes an excellent refresco with a little sugar. Café Rica—a coffee and cream liqueur similar to Mexican Kalhlúa. The same distillery produces a sugary orange flavored concoction that makes excellent ice cream topping. café—coffee. If you enjoy coffee, you are aware that Costa Rica produces some of the finest high-altitude shade grown coffee in the world. cerveza—beer. There are several respectable lagers brewed in Costa Rica. The most popular is Imperial (una águila, after the eagle on the label), followed closely by Pilsen, Bavaria, Tropical and Heineken (brewed locally under license). Rock Ice is a newcomer gaining popularity with an extra two-tenths of a percent alcohol content. Especially in Guanacaste a tall glass of ice often accompanies the bottle, and yes, you are supposed to pour the beer in the glass. These brews are priced from $0.75 to $3.00US depending on where you are drinking. Imported beers are available in most upscale hotel and resort bars, casinos and restaurants. guaro—Greece has its ouzo, Louisiana white lightning , and Mexico mescal—alcoholic beverages that seem to have stupefying capabilities beyond their proof and an aftermath beyond imagination. In Costa Rica it’s guaro. Distilled from fermented cane juice it costs about $0.40 for a generous shot and is available in bulk from some establishments if you want to fill your canteen. It can be rendered drinkable by the addition of cola or fruit juice, and if you keep the average juice content high enough the natural antioxidants and vitamins might even trim a little of the edge off of the inevitable hangover. pipa—water of a green coconut. Most often drunk with a straw from a plastic bag or straight out of the shell. Found at stands along the road or beach. refrescos—sometimes called batidos, refreshing blenderized shakes. Refrescos can be made con agua (with water) or con leche (with milk). In addition to most fruits, refrescos are made with cas (sour guava), horchata (cinnamon corn meal), zanahoria (carrots), tamarindo (tamarind) and cebada (barley). vin—wine. Costa Rica is not great grape country, and at least some of the local vintages are fermented from imported grape juice. Your best bets for a quality vintage at a reasonable price are Chilean and Argentine imports. French, German and Californian wines are available at premium prices. arroz con leche—sweet rice pudding. Costa Rica, the “rich coast” was named with expectations of deposits of gold and silver. The mineral riches are minimal, but the two coasts support a thriving fishing industry harvesting the riches of the Caribbean and Pacific. Most of the riches are exported, and prices reflect the value at the Fulton St. markets in NYC. Excellent seafood is common but more costly than other meals. ceviche—Seafood (corvina-sea bass, conchas-shellfish, langostinos or camarones-small lobster or shrimp) marinated with lime or lemon, onion, garlic, cilantro (coriander leaves) and red peppers and served ice cold. Although we have never experienced any intestinal difficulties ceviche is raw, and seafood (especially shellfish) can be a source of several nasty bacteria. Corvina is more common, and generally safer than the other varieties. pescado—fish. This is the term that is used for fish on a menu or in the market. Live fish are el pez.